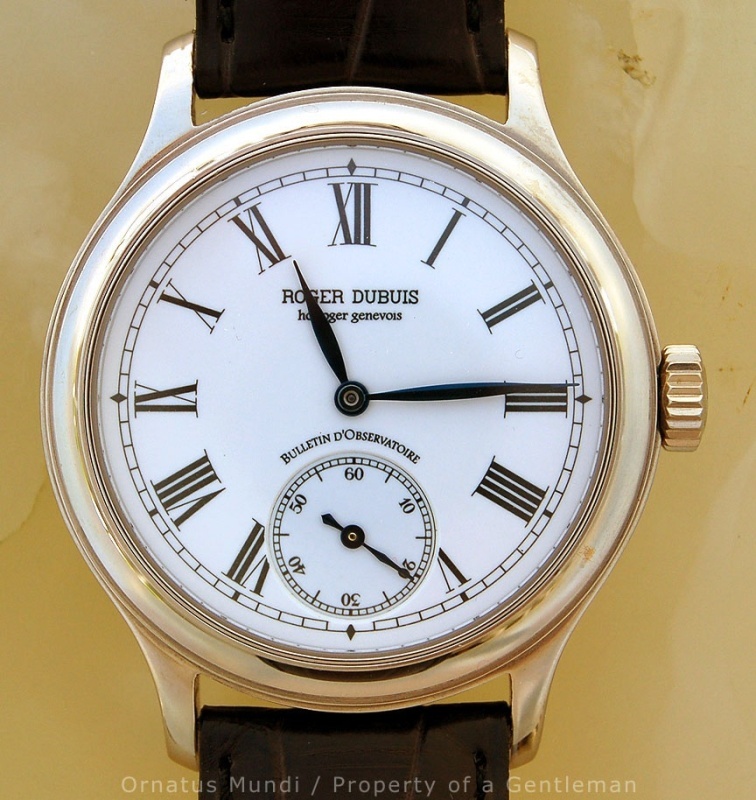 Presented as one of the first watches to be produced by Mr Roger Dubuis under his own brand in the mid-1990's, it was an unusual watch in its days: It came with a diameter of 40mm which was considered huge in these days (36mm was the 'norm' for a man's watch back then, and 38mm 'big' - long time ago!). The dial is crafted in snow white fired enamel and is of superb quality. The indications are all painted and very sharp against the white background. The image above does not show it well but the hands are proprietary designs, quite three-dimensional and executed as heat-blued steel of matched colours. Superb craftsmanship and full of life! I have always admired such hands with RD. This one is no exception, and there were other fantastic specimens particularly in the Hommage collection. Below a sapphire crystal (with the - back then - typical etched-in RD logo) lies a movement of splendid dimensions and marvellous execution. 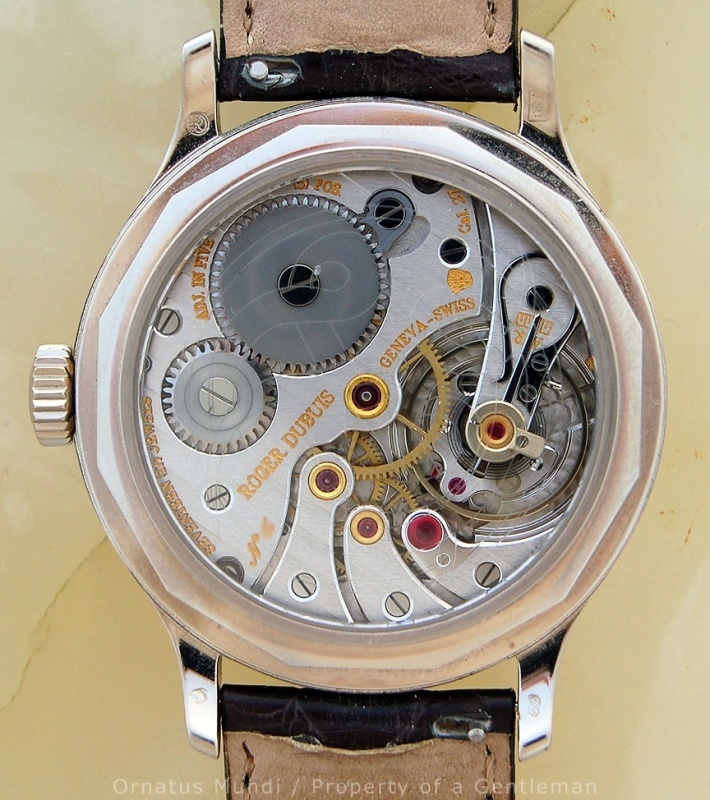 It is called the Calibre RD27 which in fact is a new-old-stock pocketwatch movement originally manufactured by Tavannes Watch Co. of La Chaux de Fonds. As with all RD watches also the Condottieri is certified according to the requirements of the Poinçon de Genève. This certification indeed necessitated a few of the above modifications, e.g. the new spring attachment and several finishing touches. It might well be that other changes had to be implemented which are not visible with a fully assembled movement like this one. First of all, it demonstrates the expert skill of the master who regulated this watch - all values are squarely within generous confidence intervals. Second, the bulletin also names the watchmaker who accomplished the regulation (there were time in Switzerland where regulateurs had a kind of a 'rock-star status'!) - in this case Mr Roger Dubuis himself! 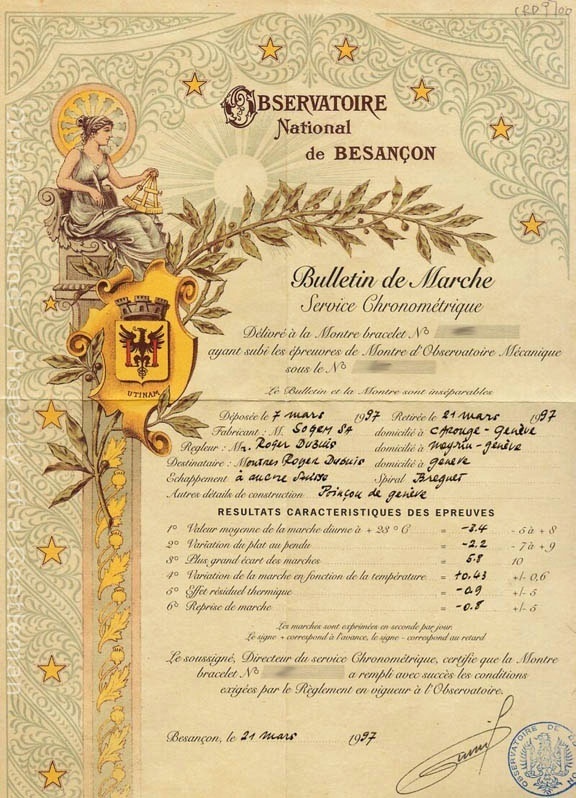 His company back then was called Sogem S.A. ("Société Genèvoise des Montres"); only later it was christened after its co-founder. As per the bulletin it also looks like there were two companies involved - Sogem (as the manufacturer) and Montres Roger Dubuis (as the 'destinataire'=consignee). I will have to inquire whether the latter was solely the marketing/sales company. Finally, I have to admit that I really love this statement on the top of the bulletin: "Le Bulletin et la Montre sont inséparables" - the bulletin and the watch are inseparable. In other words: the bulletin is an original that won't be replaced if lost. Let's spell it out clearly: Roger Dubuis' Condottieri is a downright conservative watch. 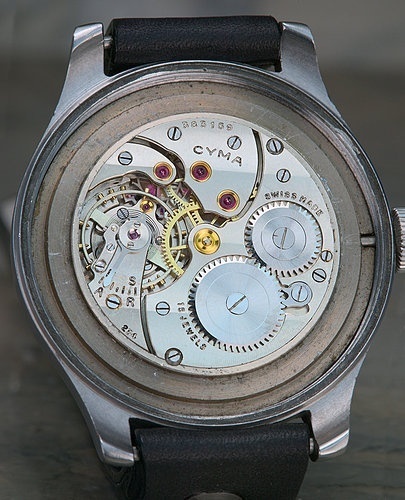 Manual-wind, three hand and a round case with an enamel dial. It even uses a 70 year- old movement! Clearly, that timepiece is nothing for those enamoured with progress. But there is something special about those really well-made simple 3-hand watches that particularly strikes a lot of chords with many, many watch enthusiasts. Just think about Roger Smith, Philippe Dufour or Kari Voutilainen. It is perhaps so because those watches are unassuming and not officious. They live of a limited and very manageable number of components. Since one does not get lost in numerous complications and myriads of parts the appreciation of the finissage of each individual of the movement's constituents is much easier - and a much more involving experience. Thus, I think ultra-fine time-only watches like the Condottieri have a certain humanistic touch to which one only can fall victim. It is a life-long 'enslavement' that brings a lot of pleasure and enrichment. Subtle difference can be understood. 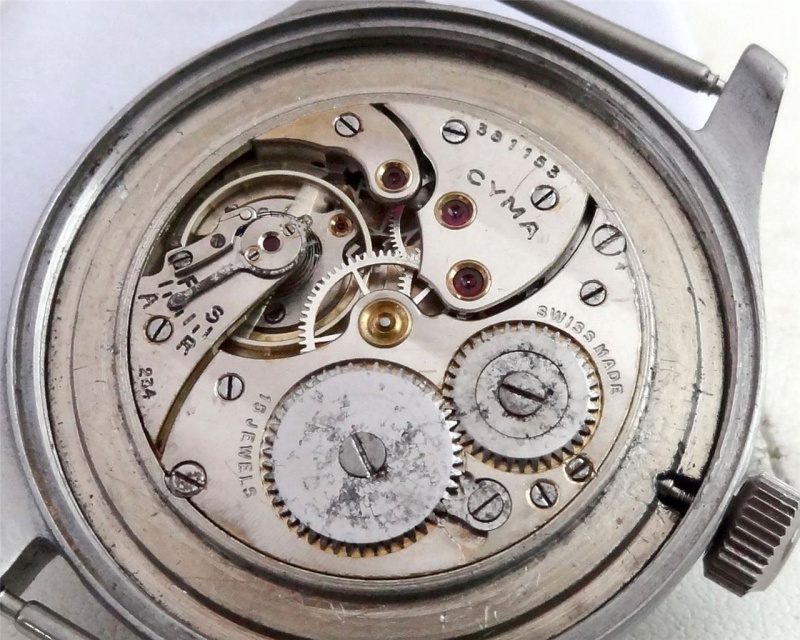 For example, the individual variations and idiosyncrasies of each master watchmakers in respect to Geneva stripes or other types of finishing can be studied better with such movements. Thus, these watches are cornerstones for a deeper understanding of individual watchmaking languages and thereby make us 'better' connoisseurs. I just wish such watches would be offered also today - and not only by a few very select independent masters! A successor to this watch is DEEPLY missed in the current RD collection. Does this sound like I just submitted my declaration of love? I hope you enjoyed this little report! The man was at his best. Thanks Magnus. That's encouraging news about the Hommage. of an outstanding watch. 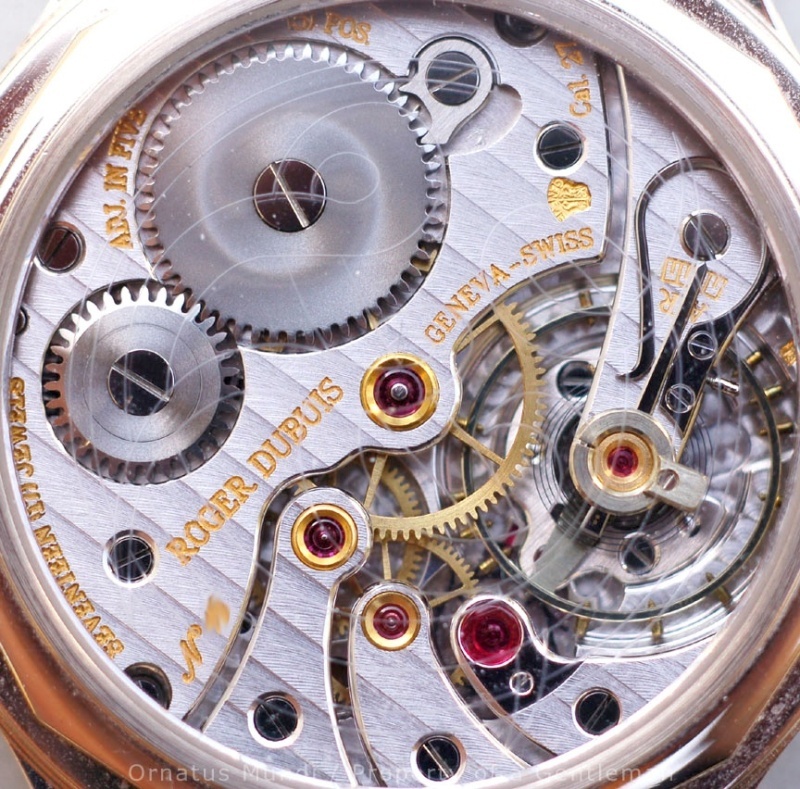 I really like how you captured the subtle layers of the dial and its surface structure. And of course, I adore the movement pic. I can't wait to see more! Have a nice week, Magnus P.S. : One question: how does it sound ? When I wrote about this watch in 2001, I included: ... after 47 utterly silent and smooth turns is this watch fully wound." and last I checked this was still the behavior of my example.